Caldo de piedra. If you’ve never run across it in your peregrinations into New York’s Mexican restaurant scene, it’s probably because it seldom makes its way this far north of the border. 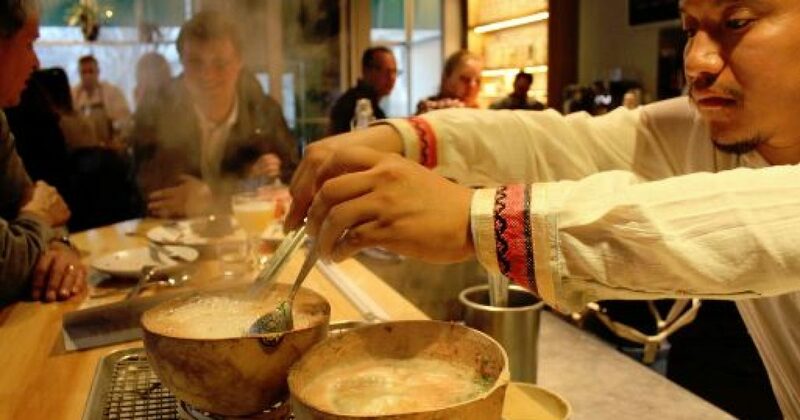 But the dish — created two millennia ago by the Chinanteco community, an indigenous people who still reside in the tropical mountain town of San Felipe Usila in Oaxaca — will be available in New York for one night only, Nov. 19, at The Black Ant in the East Village. Caldo de piedra, which translates to “stone soup,” is more properly speaking a seafood soup that is served in a hollowed-out gourd known as a jicara. The broth is thick with chunks of red snapper, shrimp, cilantro, chilies, and tomatoes, the entirety perfumed with epazote — an herb reminiscent of oregano and fennel. But the real magic is provided by the river stones that lend the dish its name. These are heated over an open fire until they are white-hot, then immersed into the gourds, where they cook the seafood and vegetables in minutes. For this special pop-up event, the soup will be paired with contemporary dishes from Black Ant’s menu. The event runs from 7 p.m. to 10 p.m.
Tickets, priced at $55 a head, may be purchased here.